Deeper than your standard tub, the Laura 5.58 ft. Centre Drain Soaking Tub in White allows for full-immersion luxury soaking and supreme relaxation. Contemporary styling and clean lines contribute to the freestanding bathtub's modern aesthetic, sure to enrich your bathroom ambience and add a hint of serenity. This unit includes a floor-mounted single-handled brushed nickel faucet along with overflow and drain outlets in brushed nickel to complete the setup. The acrylic construction is strong, light and warmer to the touch than everyday steel or enamel tubs, allowing for easy installs and heat-retaining soaks. 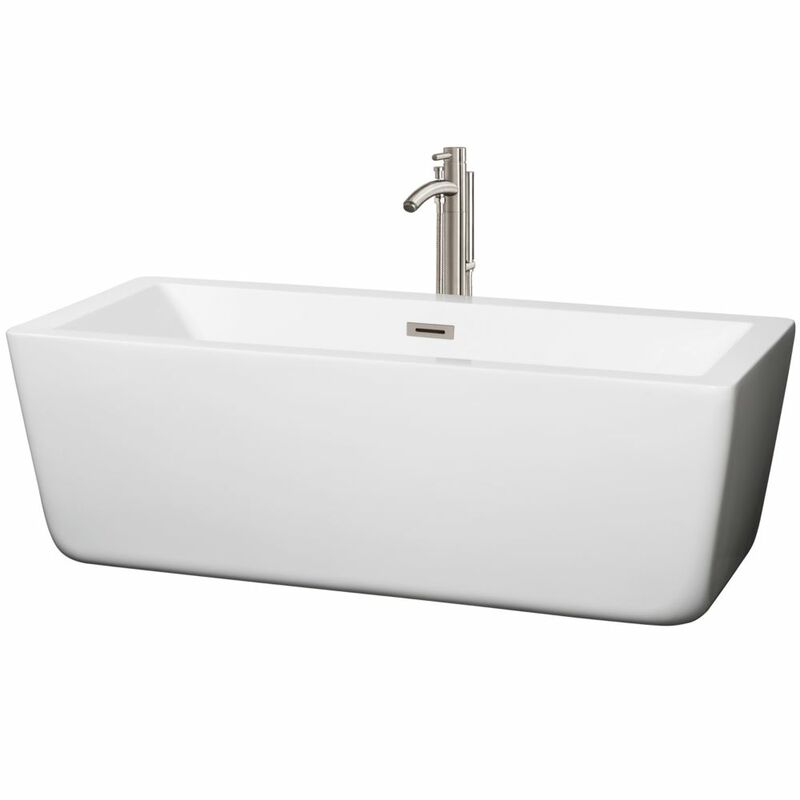 Deeper than your standard tub with a chic rounded look, the Mermaid 5 ft. Centre Drain Soaking Tub in White is a superb choice for smaller bathrooms or confined spaces. Contemporary styling and soft lines contribute to the freestanding bathtub's modern aesthetic, sure to enrich your bathroom ambience and add a hint of serenity. This unit includes a floor-mounted single-handled brushed nickel faucet along with overflow and drain outlets in brushed nickel for a polished look. The acrylic construction is strong, light and warmer to the touch than typical steel or enamel tubs, allowing for easy installs and heat-retaining soaks. Laura 66.5-inch Acrylic Centre Drain Soaking Tub in White with Floor Mount Faucet in Brushed Nickel Deeper than your standard tub, the Laura 5.58 ft. Centre Drain Soaking Tub in White allows for full-immersion luxury soaking and supreme relaxation. Contemporary styling and clean lines contribute to the freestanding bathtub's modern aesthetic, sure to enrich your bathroom ambience and add a hint of serenity. This unit includes a floor-mounted single-handled brushed nickel faucet along with overflow and drain outlets in brushed nickel to complete the setup. The acrylic construction is strong, light and warmer to the touch than everyday steel or enamel tubs, allowing for easy installs and heat-retaining soaks.